As a year of exceptional and often unexpected change comes to an end, we look back at the state of the world in 2016 through the lens of our reports. When it came to enabling global trade over the last year, Asian countries have been outpacing many European nations. 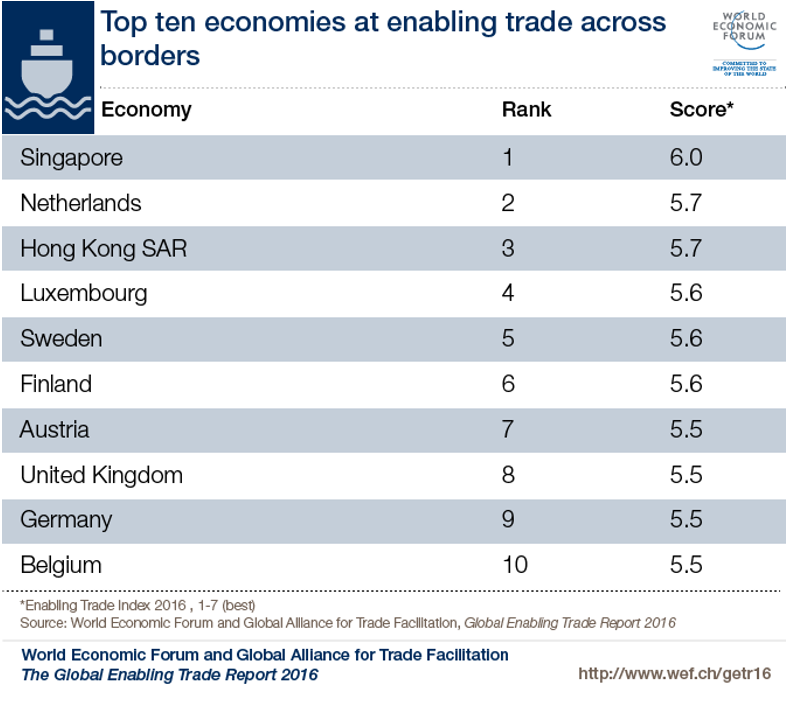 For the fifth time, Singapore took the top spot in the World Economic Forum’s Enabling Trade Index . Its domestic market was rated as one of the world’s most open and its border processes as best-in-class. The most improved region was sub-Saharan Africa, which had made significant advances in areas such as market access and ICT adoption. However, the European Union and the United States were deemed to be becoming less open for trade. 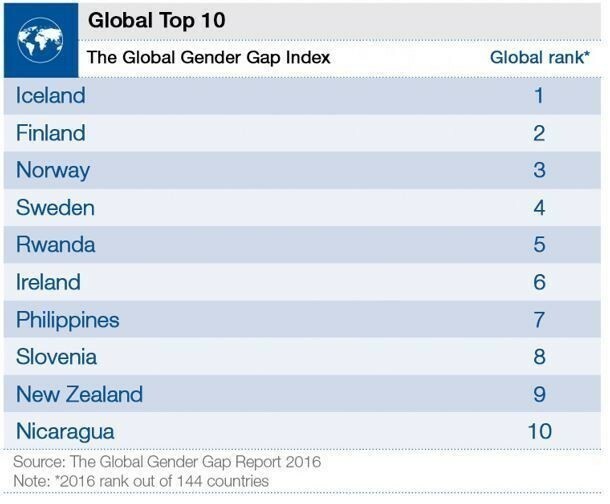 Closing the gender gap remained a hot topic in 2016. The Forum’s Global Gender Gap Report 2016 found that, based on current global trends, a new-born girl will have to live to 83 to see the gender gap in health, education, economic opportunity and politics close completely. While there had been progress in some areas and regions, disappointingly the economic gender gap had reverted to where it stood in 2008, from a peak in 2013. Iceland took the top spot for the eighth time in a ranking dominated by smaller European nations, especially the Nordic countries. 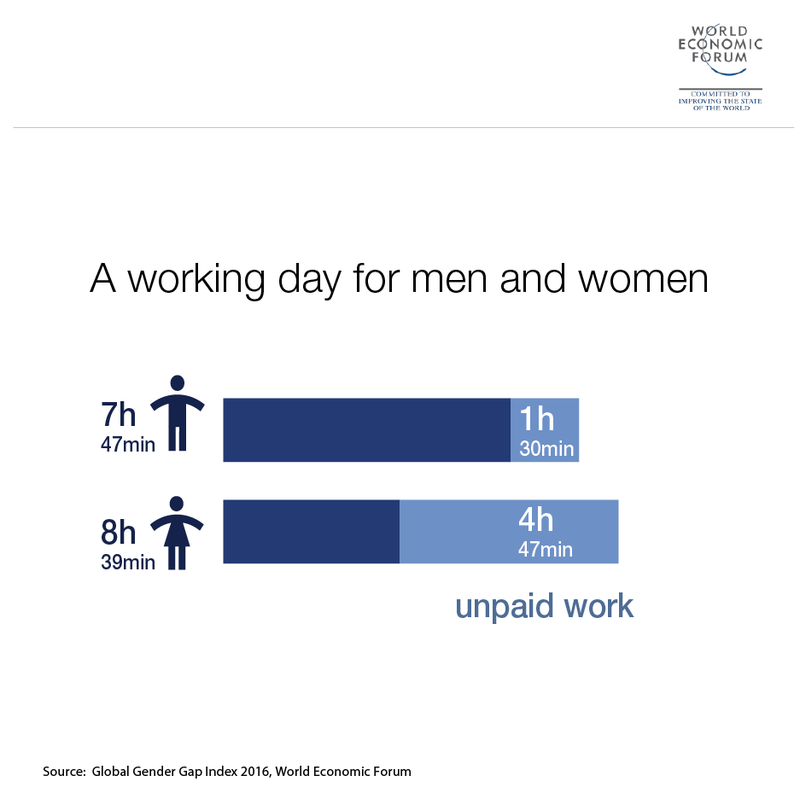 A more surprising finding was that women generally work an hour longer than men, providing just under five hours of unpaid work a week, compared to 1.5 hours for men. In a year dominated by trade alliances, whether negotiating new deals or revisiting existing ones, the Global Competitiveness Report 2016-2017 warned that a 10-year decline in openness was threatening global growth. 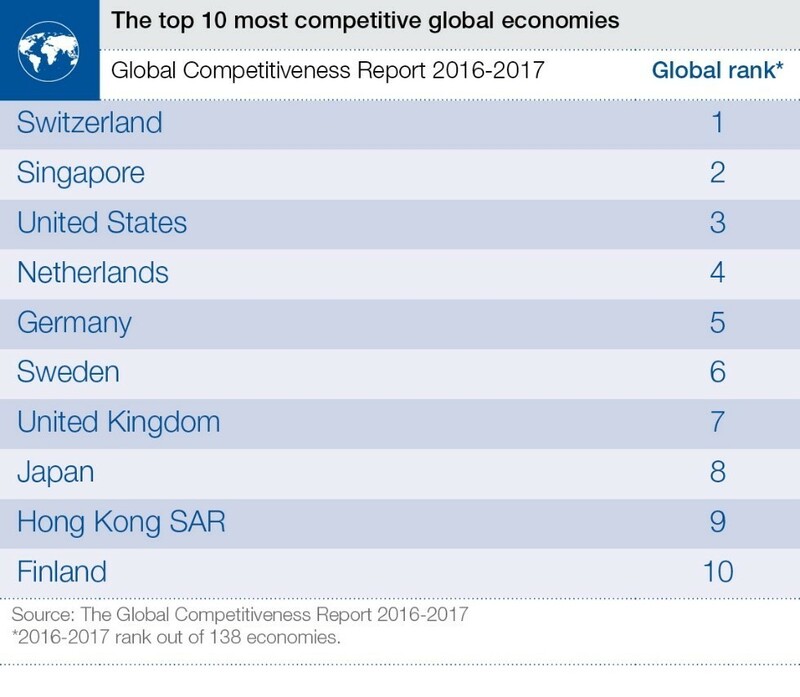 Switzerland, Singapore and the US remained the world’s most competitive economies. 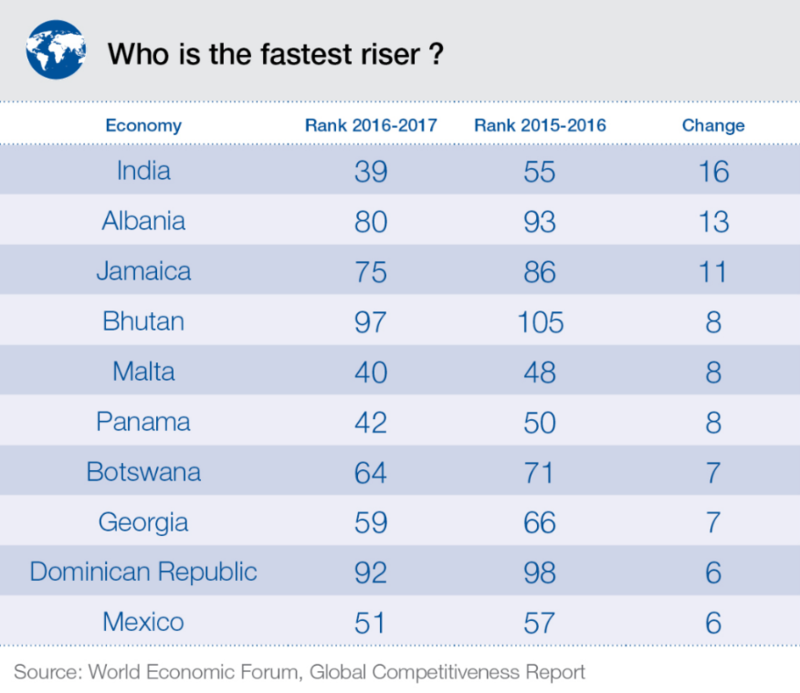 India emerged as the highest-rising economy, climbing 16 places. Its competitiveness had improved across the board and it had recorded the highest growth among G20 countries, though lack of infrastructure and ICT use remained bottlenecks. For emerging economies like India, the report found that updated business practices and innovation have become as important as fundamentals like infrastructure, skills and efficient markets. As the technological advances gather pace, change continues to be the only constant. The Human Capital Report 2016 found that rich and poor countries alike are struggling to keep pace with this new era, dubbed by many as the "fourth industrial revolution". Education systems in many geographies are unable to close the chasm between the skills workers have and the skills employers require. 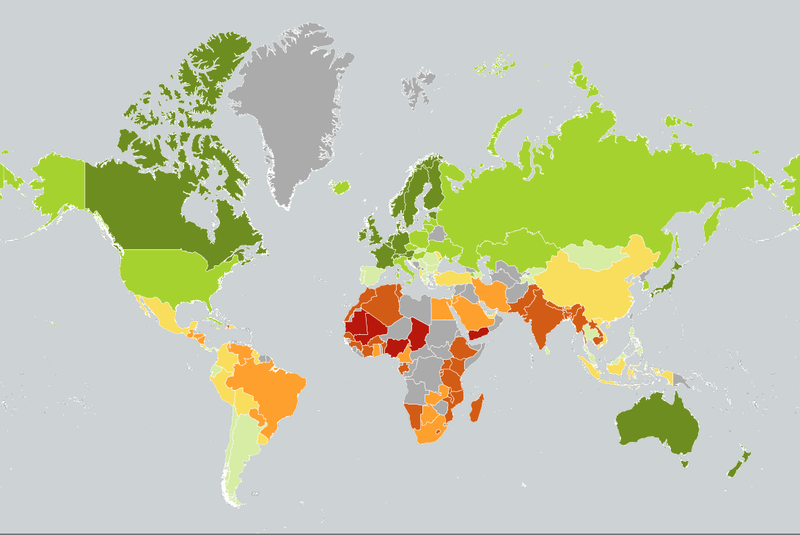 Other countries are doing better, with Finland, Norway and Switzerland holding the top spots, using around 85% of their human capital. However, overall, only 65% of the world’s talent is developed in line with current and future economic requirements. The Future of Jobs report further explored the impact of technological, demographic and socio-economic disruption on jobs and skillsets. 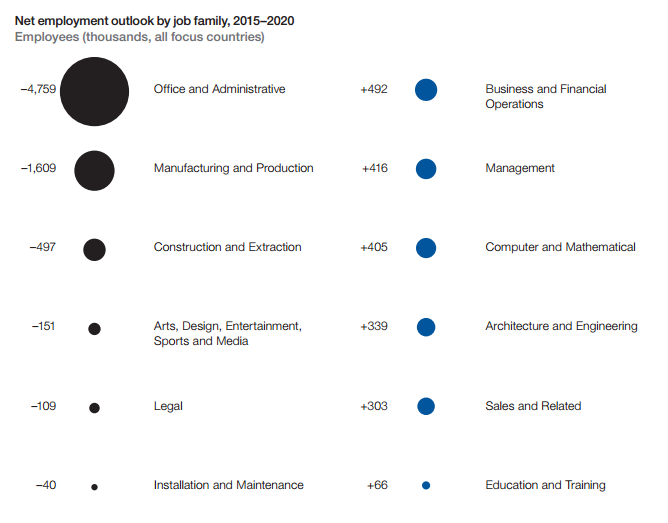 As the chart above shows, the top three job families set to decline dramatically between 2015 and 2020 will be office/administration, manufacturing and construction/extraction. Business, management and computing skills are top-rated for growth across all the countries covered by the report. Again, aligning education and training with these changing job profiles is a challenge that many countries are struggling to meet. Concerns about employment also feature highly as a short-term concern in the Forum's Global Risk Report . However, geopolitical factors such as large-scale involuntary migration, crises and conflicts continue to dominate the minds of policy-makers and business leaders. This reinforces the need to address the global refugee crisis, through both immediate and long-term measures. 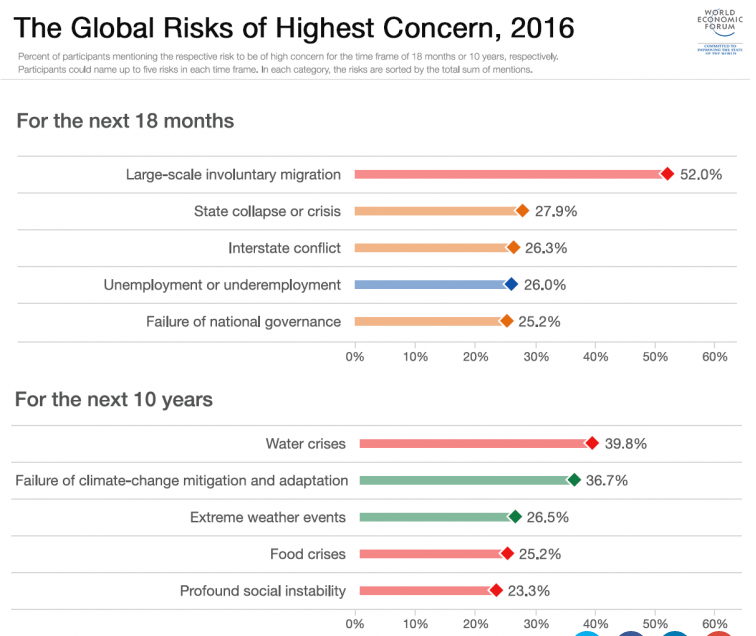 In the next 10 years, however, the risks associated with not reining in climate change and the resulting impact in terms of water shortages and food crises will become more prevalent. It looks like 2017 is shaping up to become the year when many of the challenges that have arisen over the past few years will have to be addressed much more proactively by the international community, to ensure future growth and prosperity.